We heard rumors that this was taking place yesterday, but there just weren't enough details to post here. Daniel Hawke was arrested by officers with the Humboldt County Drug Task Force assisted by the EPD, CDOJ, and even the FBI, drawing to a close investigations that lasted more than a year. And Hawke deserved an investigation this big. Word on the street is that he has been operating a very, very large marijuana growing conspiracy for many years. He would essentially buy homes in the area, mostly in Eureka, then rent them for extremely high rates specifically to pot growers, allowing them to "blow it up" in the home without fear of landlord intervention. We even heard that he frequently financed the grow operations, then collected a cut of the proceeds come harvest time (a generous cut, of course). But Hawke's reputation is not positive among the growers he rents to. We have heard reports of him showing up at rental properties a couple months into the lease and kicking tenants out because he decided to sell the home, even though he guaranteed the tenants enough time and freedom to grow pot in exchange for the super high rents he charges. What's a pot growing tenant to do in that situation? Further, the rumors say he neglects his properties, leaving repairs and upkeep to the tenants who already pay exorbitantly high rents just to grow weed. 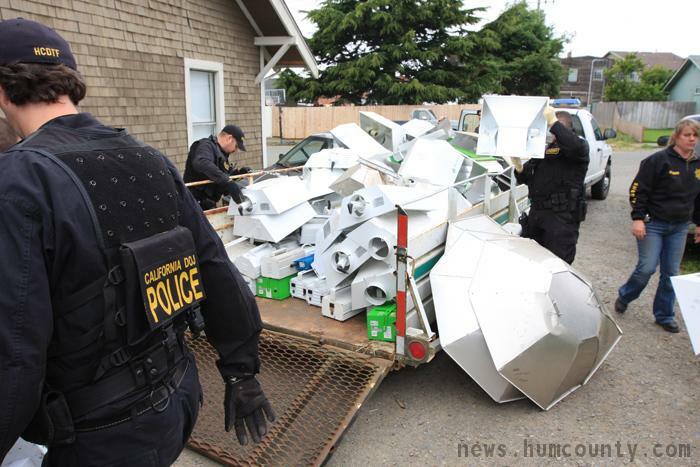 Whether or not those rumors are true, one thing is for sure: Hawke is busted as of yesterday, and the Eureka Reporter says there will be even more raids today, no doubt cleaning out the rest of the properties Hawke owns, all of which are likely homes of growers being taken advantage of by this "entrepreneur". So for anyone who says pot growers don't contribute to the housing problems we have in Humboldt County, what do you say now? Here we have a blatant marijuana growing conspiracy built upon scores of homes, properties, and even an apartment complex, all purchased with pot money specifically for the purpose of renting to pot growers in order to grow more pot so that more real estate can be bought and rented to more pot growers. Man, talk about poisoning the community... good riddance, Daniel Hawke. We will enjoy reading the reports of your prosecution. Dept of Justice, FBI, "conspiracy"... sounds a lot like last months raids in so-hum, doesn't it? Gee boys ya think it might be coming to an end around here with all the greed and growing? !